Ashley C. Dauda has seven years of experience as a development professional. 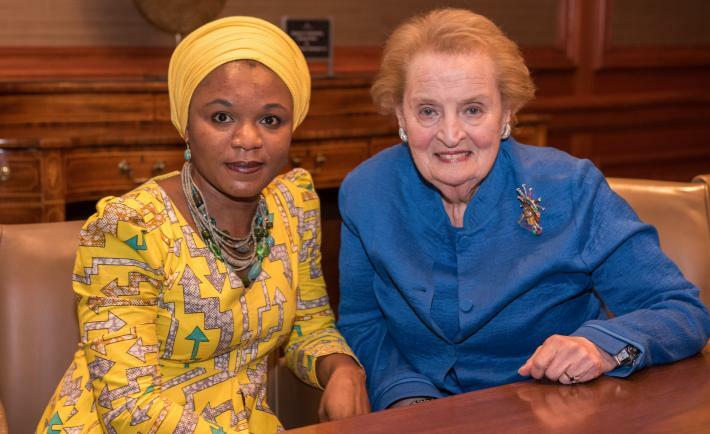 She currently serves as a program officer with the National Democratic Institute in the Nigeria field office in Abuja, where she provides support in the design and implementation of programs to increase women’s political representation in Nigeria. Prior to joining NDI, Ashley managed a coalition of over 80 women’s groups to mainstream gender and promote women’s participation in peacebuilding in Jos, Plateau state–a community with a history of ethnic and religious conflict. Also in Jos, she worked to mediate and facilitate dialogue between Muslim and Christian youth. Ashley holds a master’s degree in conflict management and peace studies from the University of Jos, Nigeria, with a focus on the use of inter-religious dialogue as a tool for peacebuilding. She also has a professional certificate in public policy from the University of Berkeley, California. Ashley is a Mandela Washington Fellow and a Fellow of the United Nations Alliance of Civilizations and Education First summer program.